Another installment of our blog collaboration is here and I guess you could say that we have gone International. Our March guest is my friend, Liz McGuire from Glasgow,Scotland. She is amazingly talented and has been on many Design Teams as well as being published in numerous paper-crafting magazines. We wanted Liz to choose our theme for this month's posts and she came up with this Inspiration Board. Don't you just love these colors, especially with Spring right around the corner ?!?! 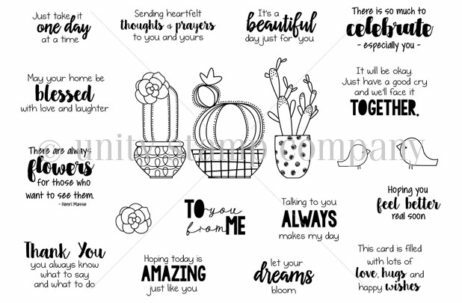 As soon as I saw this, I immediately thought of a stamp set that I have had for awhile but have not gotten inky yet. I'm sure you have some of those in your stash,don't you ? I had fun paper-piecing on this card - one of the techniques that I love using, It allows me to combine 2 of my loves - stamps & patterned paper !! I started off with a patterned card base by My Mind's Eye that was a perfect color for this challenge. I kind of have a "thing" for boxes of patterned cards. 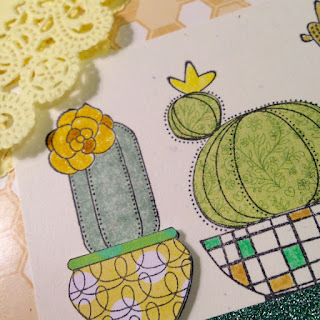 I stamped the succulents and sentiment from the Unity Stamp Company stamp kit Succulent Salutations, which was their June 2016 sentiment kit. It is an amazing kit with the main image, 14 sentiments, a flower and 2 cute birds. My ink pad was Memories Black India Ink. A yellow doily was folded and placed in the upper L corner. The sentiment was stamped, then punched out with my ever-faithful square paper-punch. I then stapled it to a contrasting square of patterned paper and attached it to the doily with a Pop-Up Glue Dot. On the main image of succulents, I paper-pieced the R and L vases and the middle succulent. I then colored the remaining areas with my Tim Holtz Distres Markers. For some shimmer, I used a Wink of Stella Clear Glitter Brush Pen. A strip of glitter washi was placed at the bottom of the image as a shelf for the succulents. Tombow Adhesive was used to adhere the stamped images, paper-pieces and doily onto the card. This month's card has been brought to you by an amazing cup of Jamaica Me Crazy coffee in my wonderfully colorful mag. I hope that you are inspired by our Inspiration Board chosen by Liz and that you liked the card I created. Now it's time for you to head over to Crafting Junky to see what Celeste came up with. 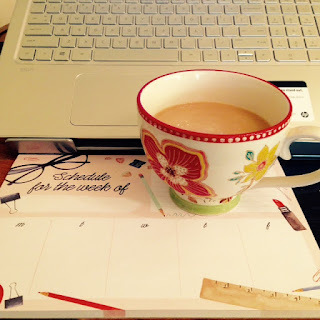 I hope you will also take a look at Liz's blog Buttons for Brains - I am sure that she has outdone herself !! We welcome your comments on each of our blogs and also invite you to follow each of us. Thank you SO much to Liz for helping us broaden our horizons and taking this collaboration to another level !! Thank you for stopping by ! !I'm so glad you liked my card - it was a fun one to create !! What a great card Deb! 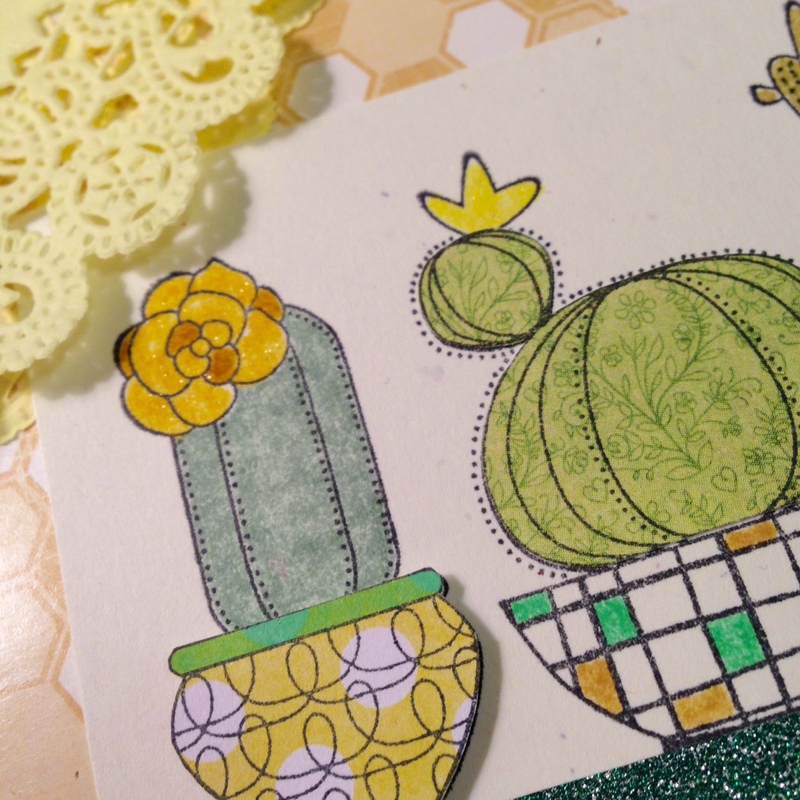 I love the cacti and that awesome yellow doily detail! So fun, gotta love all the cacti! Your card is spot on! Love those stamps and paper piecing is a great idea. Gorgeous cup too!! Thanks for letting me join in the fun! !